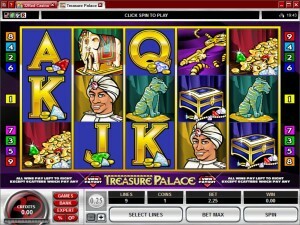 Games themed around treasures are a dime a dozen in the casino industry. However, Treasure Palace’s action takes place in a palace that belongs to an Indian Rajah, a monarch of that country. It’s a place filled with gold coins, jewelry, gems and statues of local animals. It’s not an overly complicated slot machine, on the contrary, but some players will find that to be an advantage. 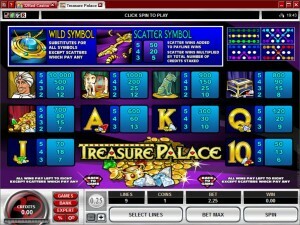 Microgaming is the developer behind this slot. 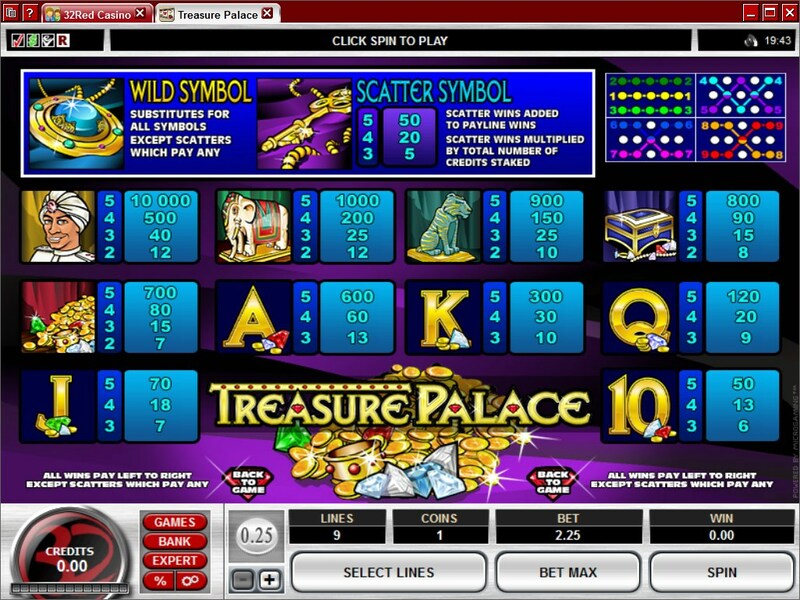 You will discover inside this game that only 9 paylines are used on the 5 reels. There are also only two simple features, a scatter symbol and a wild. The top prize offers you $20,000. It’s one of those simple slot machines, with just a scatter and a wild, nothing else. You don’t have anything else, the symbols are as basic as they can get. The Pendant symbol will often give you a hand, being the substitute that will take the place of others. New combinations may be formed with the Pendant’s help, as long as this symbol appears in the right spot, at the right time. It will not substitute for a scatter symbol, but all the others are fair game. The wilds can’t create their own combinations, which is why I said that it’s a very basic symbol. It doesn’t have multipliers either. The Gold Key is the only other symbol with special powers. Used as a scatter, it doesn’t have to appear on an active line with its symbols, being enough if you get it on at least three reels, in any position. It offers a prize when this happens, valued at 5x the bet. If additional scatters are present, the payout goes up. It’s 20x when four scatters are there and 50x when there are five. You don’t have to work too much on the wager. Once you’ve decided that you want all the lines active, all that is left to do is to choose the coin’s denomination, since only one is used in each case. The denomination goes between $0.25 and $2, allowing you to wager $18 when you select all 9 lines. There is a 10,000 coins jackpot on the line, which should mean up to $20,000 cash. The treasure theme is visible everywhere you look, even in the playing cards, as they have gold coins and precious stones next to them. The attractive symbols are the ones that also pay better, themed around treasures, showing you the Indian Rajah and things like jade statues of tigers, or elephants made out of ivory. It’s a good looking design, but overall it feels as simple as the list of features. Symbols: Pendant (wild), Gold Key (scatter, 50x wager), Rajah (10,000x), Ivory Elephant (1,000x), Jade Tiger (900x), Jewelry Box (800x), Treasure (700x), Ace (600x), King (300x), Queen (120x), Jack (70x) and 10 (50x). I’ve enjoyed the game, despite the rather simple features. The graphics look good and they might be enough to give you a decent experience, especially if you don’t usually go for the titles with lots of options. 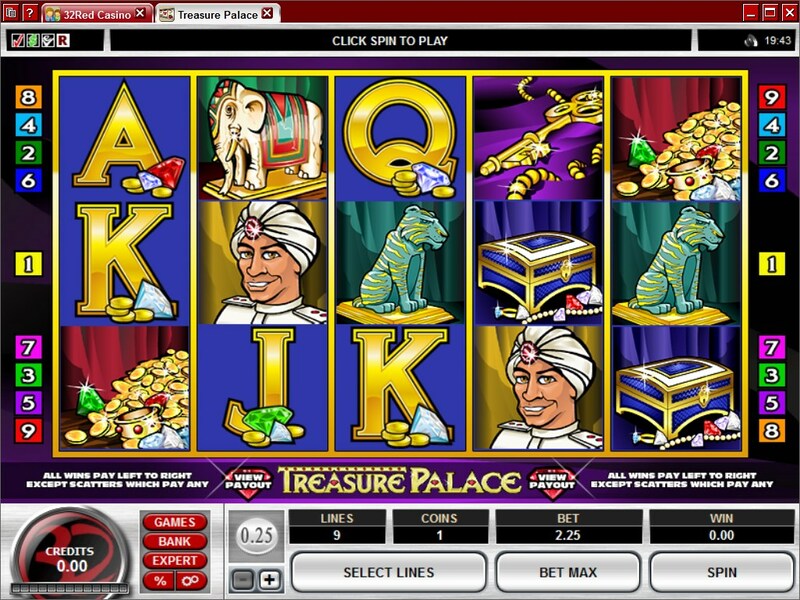 This Treasure Palace slot is offered by all online casinos with Microgaming software, playable either in practice or in real money mode.